Olympia - Lacey - Dupont - Yelm - Tumwater - Steilacoom - Lakewood - Tacoma & surrounding Washington cities. Your grout will look brand new again. After cleaning, we can seal to the tile and grout to help keep it clean. Or, we can permanently recolor your grout to any color you'd like. 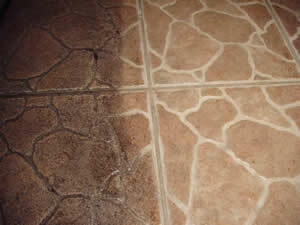 Step 1 - Pre-Inspect - We'll thoroughly inspect each tile and grout line for stains, cracks, or other potential hazards. We'll also test to see if your grout currently has sealant on it. Step 2 - Sweep - Just like with carpet, we'll remove as much dry soil before intoducing cleaning products or steam. Step 3 - Mask/Protect - Depending on soil conditions and which cleaning agents we will be using, we'll take the time to mask sensitive baseboards, appliances, or other objects which may be damaged by certain cleaning products. Under normal soil conditions, this step is not necessary. Step 4 - Pre-Condition - We'll pre-spray the tile and grout with a specialized cleaning solution formulated to break down grease and oils. Step 5 - Agitate - Using a variety of brushes, we'll penetrate the pre-conditioner into the grout lines to help ensure maximum effectiveness. Step 6 - Steam Cleaning - We'll use our patented, high-pressured tile spinner attached to our truck-mounted steam cleaning system to blast away the soil and our pre-conditioner. Step 7 - Treat Stubborn Stains - If any stains remain, we'll attempt to remove them with the appropriate cleaning agent at this time. Step 8 - Post-Inspect - After the cleaning process is complete, we'll thoroughly inspect the entire floor to ensure that it's as clean as possible. 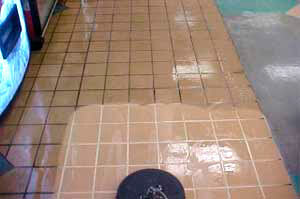 Step 9 - Seal/Dye - After cleaning, we can either seal or perminantly recolor your grout.